When building a new home consider function and design to create a feng shui bathroom. The bathroom fixtures - The sink, tub, shower and toilet operate to deliver water and then to eliminate the water from the home. The toilet is a major fixture that is used entirely for elimination and removing of waste and the water is what takes the waste out of the house. The shower, tub and sink are used for cleaning and removing of dirt and debris. They also clear out the personal chi in the washing and cleansing process. Unlike the toilet, there is an element of renewal in these three bathroom fixtures. If your home is not new, you can still apply feng shui principles to ensure proper feng shui. This is very important since the bathroom is a room of water. In feng shui, the symbol for money is water and therefore makes this room vital to your overall financial stability.The function of a bathroom is so clearly defined and limited, it's easy to identify any improper feng shui issues. You'll see a difference in your finances and health once you properly apply feng shui principles your bathrooms. Reversal in fortune - Financial losses end. By far, the best star to have fall into the bathroom is nine. This number is also associated with the color purple. Nine is a fire element and the room with the most water is a perfect placement. Two and five stars are not ideal for a bathroom, especially if you have both fall into this sector of your home. The combination forebodes illnesses or accidents related to or within the bathroom. You'll want a feng shui analysis conducted to ascertain these placements for the current year. Consider feng shui principles whether you're building a new home or renovating an older home. You can correct the feng shui of an older home, but it's always easier to apply feng shui principles in new construction. If you are lucky enough to choose where your bathrooms are located in your home, you can optimize feng shui principles. It's important to know which areas of the home are best suited for a bathroom and those that are the worst places to situate a bathroom. Drains chi the moment the energy enters the home. Second floor bathrooms directly above a kitchen or front door. The kitchen is the hearth's fire. The bathroom element of water extinguishes and damages the health and prosperity a kitchen's chi brings. Leaky Faucets mean financial drain. If you are not lucky enough to decide where your bathroom is located, you can still counter negative chi by applying a feng shui remedy. Many homes don't have the ideal bathroom placement, but you can counter the bad chi this creates with simple and inexpensive feng shui remedies. Hang a full length mirror on the inside of the bathroom door. Place a mirror directly opposite the toilet. Minimize the powerful negative effects of a toilet - Place fresh flowers or a bowl of pebbles on the tank lid. If this isn't possible, hang a shelf over the tank lid to hold the flowers or bowl. These design elements represent earth which contains water and gives it form. 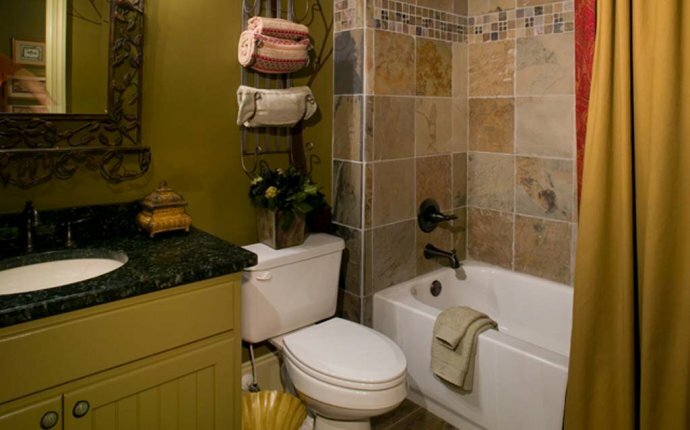 Color schemes can assist in deflecting and minimizing negative bathroom chi. Prevent loss of wealth by adding either a black or red bath rug around the base of the toilet. These colors draw fire which counters the effect of too much water. Paint the bathroom red to counter the shar chi (negative or bad chi). Place in each corner of the bathroom a large stone, crystal, pottery, vase, statue, or other object that represents an earth element. This stabilizes the bathroom's strong water elements. If your bathroom has a toilet closet, then hang a full length mirror on the inside of the door. This gives the illusion of a hidden or invisible toilet and makes excellent feng shui for a bathroom. Bathrooms are places to create good hygiene and poor feng shui care can create poor health and bad finances.